Congratulations to my classmate Clinton Etheridge and to the editorial staff of the magazine on a very moving article about his family’s recent visit to West Africa and the photos of his Peace Corps days over there. In the late 1960s, I had the opportunity to spend three months in Cote d’Ivoire on a student-exchange program with Operation Crossroads Africa, and, as an African American, it was an experience that I have never forgotten. While there, I met and worked alongside Peace Corps volunteers on community building projects. I had a sense of how much deeper the Peace Corps volunteers’ experiences were than were ours on only a three-month visit. What a wonderful idea to go back after 40 years and trace connections made in one’s student years. Sara Lawrence-Lightfoot ’66 (a mentor) writes about planning for the “third chapter” of life. The Etheridges’ journey has inspired me to think about a similar journey as I approach that stage. I was especially pleased to see that his children were interested and willing to share the experience with him. It’s heartening to see some of that generation embracing his conviction that every black American should visit the African continent at least once in their lives. Thank you for sharing this experience with the Swarthmore community. I have never set foot in Africa, but I now have come closer. The January issue’s article with photos by Clinton Etheridge Jr. ’69 about his Peace Corps service as a teacher in Gambia, and about his return visit 40 years later with his children and one grandchild—but minus his recently deceased wife—was touching in multiple ways. I felt included in his family journey. 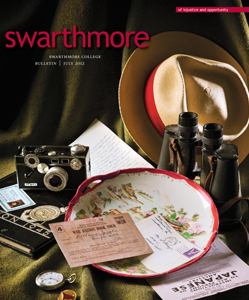 Swarthmore has been generating Peace Corps volunteers since the corps’ beginning in 1961. My class of 1963 provided four—two to the Philippines, one each to Colombia and Guatemala. By now there are dozens of PCVs from the College who have served; all our stories are different yet also similar. Clinton’s account illustrates the unpredictable paths, widely separated by time and space, that our own lives take. Yet there remain enduring ties that can be partially renewed, and opportunities for new connections. I especially appreciated Clinton’s family’s exploration of its slavery roots, a heritage whites do not have. One of my personal realities is that I instantly tend to trust fellow returned PCVs (there are more than 200,000 of us now). Clinton’s sharing of his trip reinforces my belief. I look forward to further friendship based on Swarthmore and other adventures. I hope that the family healing process that motivated his trip in 2011 continues. What a treat to have another article by Clinton Etheridge in the January Bulletin. “What is Africa to Me?” not only provides another chapter in the author’s powerful personal story but provoked me to think about the trajectories our lives take and how our relationships with children and grandchildren change with time and circumstance. As Clinton writes, “People are more alike than they are different,” and I found we share many experiences of family. His 2005 article “Crucible of Fire” provided a new perspective on events I well remembered as transforming my senior year and my view of activism. “What is Africa to Me?” gives a picture of Gambia and Africa today and 40 years ago, about which I know very little. I look forward to the next Etheridge publication. Thank you for continued production of a great magazine.